Every human experiences some degree of suffering. And, almost none of us know what to do with it. Between Pain and Grace is at once a thorough study of this major theme in Scripture AND an accessible window into God's workings in our own lives. How does God involve himself in human suffering? What part does Satan play in our suffering? What can we learn from Joseph in the Old Testament? Is there an appropriate response to suffering? An inappropriate one? What about mental illness, sexual abuse, or betrayal? Moody Bible Institute professors Dr. Gerald Peterman and Dr. Andrew Schmutzer shed much light on the nature of the lives we lead-where we are often caught right between pain and grace. 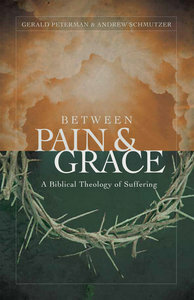 About "Between Pain and Grace: A Biblical Theology of Suffering"